Company : WinTools Software Engineering, Ltd.
A suite of tools for increasing operating system performance. WinTools.net cleanly removes unwanted software from disk drives and dead references from the Windows registry. WinTools.net puts you in control of the Windows start up process, memory monitoring and gives you the power to customize desktop and system settings to fit your needs. Adds more speed and stability for your connection. Ensures your privacy and keep sensitive information secure. 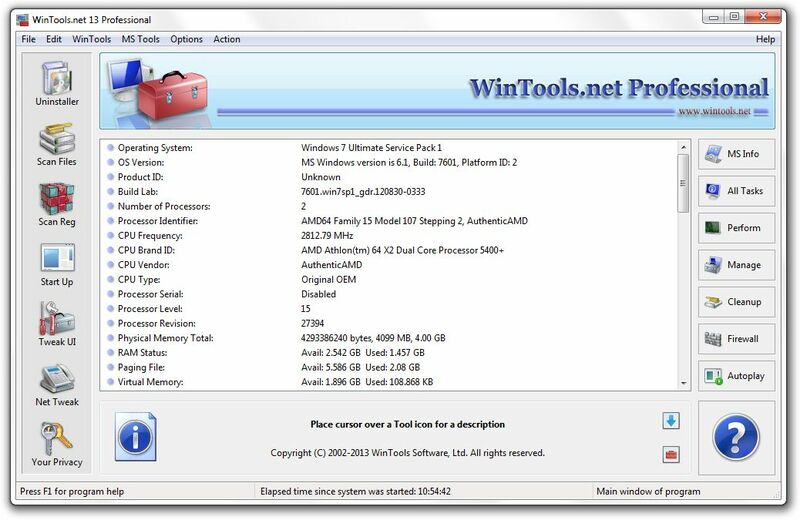 WinTools.net Professional contains tools: Clean Uninstaller, Scan Files, Scan Registry, Start Up, Tweak UI, Net Tweaker, The Privacy... Clean Uninstaller - This tool is used for both correctly removing software and for monitoring changes made to the hard drive, MS Windows registry and system files during program installations. Scan Files - This tool is used for periodic cleaning of your hard drive from dead references, junk and obsolete files produced by different software. These files and references remain on the hard disk and increase drive access time. Scan Registry - This tool is used for periodic cleaning of the MS Windows registry from unused applications remained after uninstallation and from invalid references which decrease system speed and system loading time. Start Up - This is a startup manager. This tool allows you to monitor, add, remove, enable and/or disable individual startup items. You can also adjust applications initialized during the loading process of the operating system. Tweak UI - This is a set of additional adjustments related to safety, system capacity and user preferences and which are not included into basic components of MS Windows. Net Tweaker - The tool is used for speed increasing of data transfer and for greater stability of connection by changing hidden network settings. The Privacy - This is a kit of tools which ensure your privacy and keep sensitive information secure. It consists of three basic parts: "Objects to Erase", "Invisible Man" and "File Shredder".